Bob Guarino, the new park manager and Frank Mami, the assistant park manager introduced themselves. We all signed new VSA forms, required by NYS Parks, and Frank Mami will make sure that they will be filed. Financial – reported by Jane Daniels, for Jim Brosnan: The bank balance at the end of December was $2,847.76. 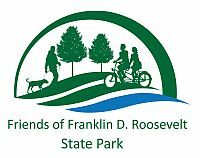 The liability insurance premium has been paid for the year and covers events run by Friends of FDR Park. We are charged for more than three insurance certificates. The Yorktown Street Fair requires we send one for their annual event. Announcements - Jane announced that she will have a student intern from Yorktown High School to work on our website. She needs to spend three hours per week and will report to Jane. The PTNY grant needs a final report to be filed. There is $150 left which we have not used. The printing and laminating of signs were never finalized. National Heritage Grant – If someone would step forward to write the grant, we could apply for interpretive signs. First Day Hike – We had 20 people attending the First Day Hike on January 1st. Four of these people were interested in the trail project. Nominating Committee: Melissa Cole, Mark Kotkin and Charlie Castronovo (chair) were appointed to the Nominating Committee for the elections of Officers to be held at our February meeting. We need six members on the Board. Anwer, Jane and Jim are Officers/Members, so we need three additional people. Since Jim will not be able to attend all our meetings, we need somebody to help him with either depositing or signing checks. Jane announced that she is willing to continue to be the Chair, but will step down in 2018. Park Manager’s Minute –Frank Mami told us that the park already has given out more permits for picnics than in prior years, due to the improvement of the park’s website with regard to spots available, prices and other options. The office manager has developed a database for tracking applications, which now include e-mail addresses. He is working on getting electronic signs made for the summer at the entrances, etc. Review of Goals – We will resume the work on the trails again in April or May, depending on the weather conditions. Wild flower seed. Mark will check on the best time of year and weather conditions for sowing the wild flower seed. We discussed the size of the area, or maybe plant two smaller areas. Frank suggested an area on the grassy side of the park along the Taconic Parkway, as well as on both sides of the ramp down to the reservoir where people put their boats in the water. It is very hard to maintain grass along the side of that ramp. He and Mark will consult as to how to best manage the project. Jane will ask Dianne if we can organize a bird walk again with the Audubon Society. On “I Love My Park Day” we will probably be working on the trails, and possibly work on the large bridge in the trail connecting to Baldwin Road. The first Saturday in June will be “National Trails Day”. This may also be a good day to get volunteers to help us work on the trails. We dioscussed a Meet & Greet on the patio of the new pool complex on a Friday evening in late June around 7:30 p.m. The sunset over the reservoir is beautiful from that spot. We may have music, food, and any other fun things we may come up with in the meantime. The purpose would be to get some more people interested and involved in our Friends group. We could possibly have people submit pictures taken in the park and give out a price. A behind the scenes tour of the pool area would be an attraction. We will visit these suggestions again in the February meeting. The meeting was adjourned at 8:30 p.m. The next meeting will be on Wednesday February 10th at 7:30 p.m., in the rear of the park office, at the Route 202 entrance.